Go to https://davis.dynatrace.com. Sign in with your Dynatrace Managed credentials. Click Account settings in the User profile menu in the top-right corner of the Davis Assistant window. 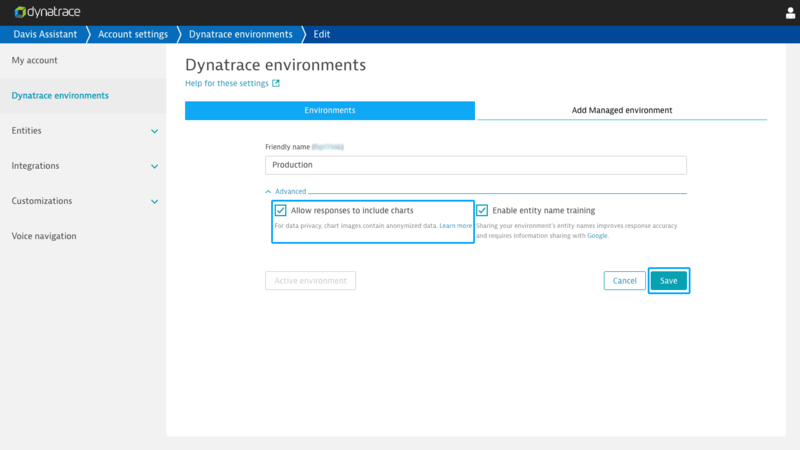 Click Dynatrace environments in the side menu and click the environment table row for which you want to enable (or disable) charts. Click Advanced to view more options. Check the Allow responses to include charts box to enable (or uncheck to disable) charts. Click Save. In order to support as many devices as possible, Davis Assistant creates and saves charts as anonymized images with no identifiable information. The images are created on demand and stored for up to 30 days in Amazon S3. The images don&apos;t require authentication for access, but they&apos;re secured using a randomly generated token in the file name.